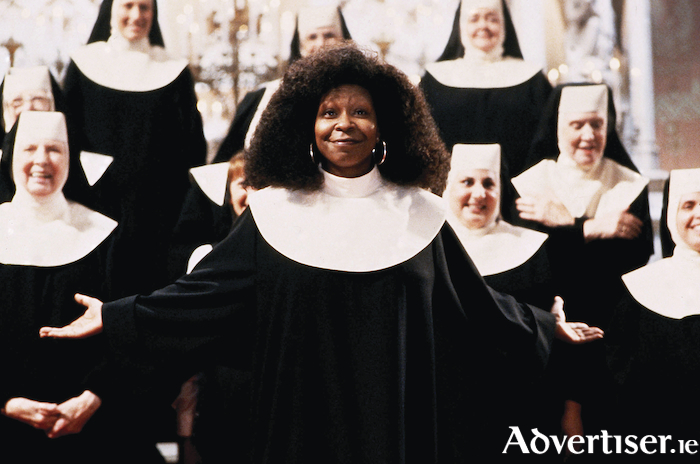 Whoppi Goldberg in the original 1992 film version of Sister Act. The cast also fetures Mike Flaherty (Monsignor O’Hara ), David Langan (Curtis Jackson ), Neil Conway (Joey ), Mike Davenport (Eddie ), Cian Elwood (TJ ), Marc O’Connor (Pedro ), Mervyn Fahy (Ernie ), Danelle McElroy (Sister Mary Robert ), Ailbhe Slevin (Sister Mary Patrick ), Sarah Gilligan (Sister Mary Lazarus ), Linsey Cant (Sister Mary Teresa ), and Niamh O’Brien (Sister Mary Martin-of-Tours ). The production is directed by multi-AIMS award winners Brian and Seán Power; musical supervision and direction is by John O’Dea; chorus director is Eoin Corcoran; choreography is by Declan J Gardiner; the costume coordinator is Tara Killilea; the sound design is by Fintan Higgins; with lighting design by Paul Kelly. Tickets are from the Town Hall (091 - 569777, www.tht.ie ).